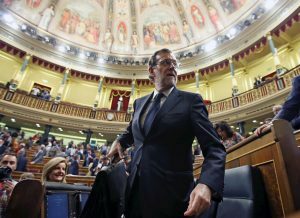 Mariano Rajoy, acting prime minister and leader of the Popular Party (PP), secured a minority government in a parliamentary confidence vote on Thursday, seemingly ending Spain’s unprecedented 10-month political paralysis. In a second confidence vote scheduled for Saturday, Rajoy is expected to win a majority, owing to the sworn abstention of the Spanish Socialists’ Workers’ Party (PSOE). The PSOE voted against Rajoy during the first round to protest conservative PP policies, but promises to abstain during the second round. Rather than let the deadlock continue, abstention is the “lesser evil,” said Javier Fernández, interim leader of the PSOE. The PP won more votes than any other party in the two previous inconclusive elections in December 2015 and June 2016, but not enough in either to secure parliamentary power. Spain’s fraught political landscape was partly caused by the emergence of two new parties, Podemos (“We Can”) and Ciudadanos (“Citizens”), which fractured traditional alliances. Pablo Iglesias, leader of the anti-austerity Podemos, was once thought to have a chance at winning during Spain’s first attempt to electing a prime minister back in December 2015. Iglesias derided the new government as “the triple alliance and the abstainers,” attempting to re-position Podemos as the main opposition to Rajoy and the PP. Saturday’s final confidence vote will likely see Rajoy squeak in just ahead of his deadline to form a government by Monday, Oct. 31. Based on Spain’s exacting timetables that trigger an election exactly 54 days after a failed confidence vote, a third election would fall on Dec. 25, Christmas Day.